The woman was stabbed a number of times before her apartment was set on fire. The apartment block in the 11th arrondisement of Paris where the elderly woman lived. 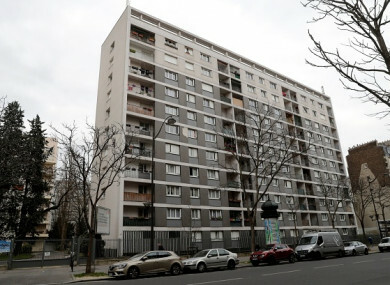 FRENCH PROSECUTORS ARE treating the murder of an 85-year-old Jewish woman whose partly charred body was found in her Paris home as an anti-Semitic attack, judicial sources have said. Mireille Knoll, who managed to flee a mass roundup of Jews in Paris during World War II, was found dead Friday in her apartment in the east of the French capital, where she lived alone. An autopsy showed she had been stabbed several times before the apartment was set on fire. Two men have been arrested over her killing and are to be brought before a magistrate to face possible charges of “murder related to the victim’s religion, real or imagined” as well as aggravated robbery and destruction of property, judicial sources told AFP. The prosecutor’s office has asked that they be placed in preventive custody. One of the men was a regular visitor of Knoll’s whom she treated “like a son” and who had visited her that day, her son told AFP, asking not to be named. “We are really in shock. I don’t understand how someone could kill a woman who has no money and who lives in a social housing complex,” her son added. Speaking during a visit to Jerusalem today, Foreign Minister Jean-Yves Le Drian said it was “plausible” that Knoll was killed because of her religion and her death showed the need for a “fundamental and permanent” fight against anti-Semitism. The chief rabbi of Paris, Haim Korsia, wrote on Twitter that he was “horrified” by the killing. Investigators had said yesterday they were “not excluding any hypothesis” with regard to the motives for her murder. Knoll managed to evade the notorious 1942 roundup of more than 13,000 Jews in Paris by fleeing with her mother to Portugal. Fewer than 100 of those who were detained at the so-called Veld’Hiv cycling track and then sent to the Nazi death camps survived. After the war Knoll returned to Paris and married a Holocaust survivor, who died in the early 2000s. France’s half-a-million-plus Jewish community — the target of several deadly Islamist attacks in recent years — has expressed alarm over a rise in violent anti-Semitic acts. Last month, a judge confirmed that the April 2017 murder of Sarah Halimi, a 65-year-old Orthodox Jewish woman who was beaten and thrown out of her window, was motivated by anti-Semitism. Email “French officials believe fatal stabbing of 85-year-old woman was anti-Semitic attack”. Feedback on “French officials believe fatal stabbing of 85-year-old woman was anti-Semitic attack”.